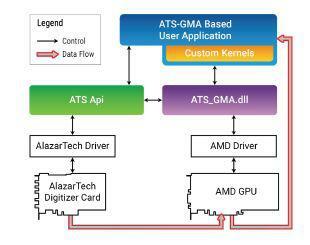 AlazarTech, a manufacturer of high-performance, low-cost PC-Based Instruments, today announced the release of ATS-GMA™, a software library that allows users to DMA data from its PCI Express waveform digitizers to AMD Radeon™ Pro Graphical Processing Units (GPUs) at rates up to 6.9 GB/s with latency as low as 100 μs. In the coming weeks, AlazarTech will also release add-on libraries that allow users to perform additional signal processing on data captured into GPU memory by ATS-GMA-BASE. ATS-GMA is compatible with Windows® 10. ATS-GMA-BASE includes a sample program written in C/C++ source code, which implements very simple GPU kernels that invert data and write it back to a buffer in computer memory. U.S. prices are listed below. International prices may be higher. Volume discounts are available. For further information, contact Muneeb Khalid at 1-877-7-ALAZAR or +1-514-426-4899 or via e-mail at muneeb@alazartech.com. Mailing address is AlazarTech, 6600 Trans-Canada Highway, Suite 310, Pointe-Claire, QC, Canada H9R 4S2. Company web site is www.alazartech.com. AlazarTech, headquartered in a suburb of Montreal, Quebec, Canada, provides high performance, low cost PC Based Instruments and software for customers involved in building OEM products, manufacturing test systems and research and development. AlazarTech was founded in 2003 by Muneeb Khalid, who was the original founder of Gage Applied Sciences Inc., a pioneer in PC Based Instrumentation. That company was sold to Tektronix Inc. in 2000. While AlazarTech manufactures some of the fastest PCI and PCI Express digitizers on the market, speed alone is not the differentiating factor. AlazarTech concentrates on providing usability features for its PCI and PCI Express digitizers that make them very easy to integrate into real-world OEM applications such as ultrasonic testing, medical imaging and radar signal analysis. The key differentiation between AlazarTech products and the rest of the industry is AlazarTech’s Dual-Port Memory technology, which enables OEMs to create systems that can capture, analyze and store data in real time. Customers can use AlazarTech products not only for R&D, but also deploy them in the field. Competitive products use single-port memory, forcing customers to stop acquisition in order to read data, thereby limiting their usefulness to R&D and algorithm development. AlazarTech also works with selected OEMs to customize its products based on customer requirements. The company's line of ATS PCI and PCI Express digitizers have been recognized by leading European, Asian and North American OEMs as being superior in quality to other devices on the market. The company's products have found applications in industries such as medical imaging, metal inspection, defense, automotive and semiconductor test. AlazarTech sells its products directly in North America, and internationally through a distribution network. For more information on AlazarTech, visit www.alazartech.com. † Radeon is a trademark of Advanced Micro Devices, Inc.
OpenCL is a trademark of Apple Inc.
NVIDIA and CUDA are trademarks and/or registered trademarks of NVIDIA Corporation in the U.S. and/or other countries. Windows is a trademarks and/or registered trademark of Microsoft Corporation in the U.S. and/or other countries.